2016 was the year for fun fashion trends. Chokers made a comeback, fur was added to everything, and off-the-shoulder tops and dresses were a cute way to add a bit of flirtation to an otherwise simple outfit. Looking back on this year, I can honestly say that I loved the trends, and I hope we hold onto some of them in the New Year! 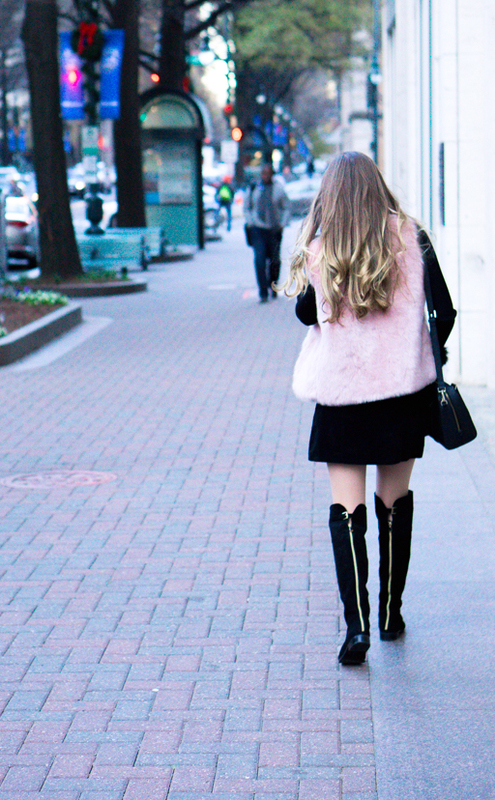 For this look I combined a pink faux fur vest with an all black outfit. The pink fur was a big statement piece for an otherwise monochrome, simple outfit, and I enjoyed adding a bit more (yes, more) fur with these fun gloves I found from Target. I also incorporated some black, suede over-the-knee boots, which is an easy and comfortable way to flatter and elongate the legs. The best part is that all of the pieces in this outfit are under $100, which makes it easy to follow these fashion trends without breaking the bank! Now tell me, what were your favorite fashion trends from 2016 and what are you looking forward to most in 2017? Have a safe and wonderful New Year filled with glitter and champagne! You are right there were a lot of beautiful trends! My favourite one was bell sleeves!